The breviary gives hymns, prayers and readings, along with instructions, for the prayer services called the 'divine office' which were said several times each day. The feast days of saints were provided with special prayers. 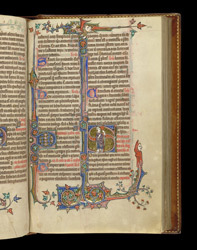 Set into a richly bordered page, the office for the feast of St Martin (commemorated on 11 November) begins with a full-length portrait of the saint in a historiated initial. The beautifully painted imaginary heads which emerge from the border appear throughout the manuscript.